I’ve got another great Facebook “Like” freebie! Visit Crystal Light’s Facebook page and click the “Like” button & fill out the form and they’ll mail you 3 Free samples packs of their singles low calories drink mix! The form only takes a minute to fill out. 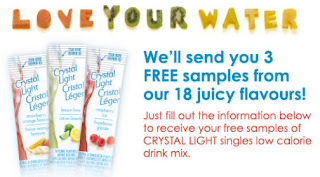 After you fill it out, you’ll get a message telling you “Your CRYSTAL LIGHT singles samples will arrive by mail in approximately 3 to 4 weeks.” There are limited quantities available and a limit of 1 per person, email and address. Click here to visit Crystal Light’s Facebook page. This is a limited 1-day only sale that will expire at midnight (Tuesday, May 10, 2011). Click here to buy now or for more information about the deal. Quantities are limited so don’t miss out! What would be a better way to ring in the summer season than with Saugeen Summer Nights! If you have been looking for a music festival featuring Johnny Reid, Dierks Bentley and Dean Brody(I know I just freaked out a little bit too)then do we have a deal for you! For a limited time, Crocs online is having a huge save up to 60% off sale on men’s, women’s and children’s styles. There is free shipping on orders of $100 or more. If you don’t own a pair of Crocs, I highly recommend you get a pair. They are so comfortable and light. Click here to shop Crocs online now or for more information about the deal. REMINDER: I originally posted about this deal last week. Here’s a reminder that this deal is good valid and goes until Sunday, May 15, 2011. This is one of Starbucks best promotions. 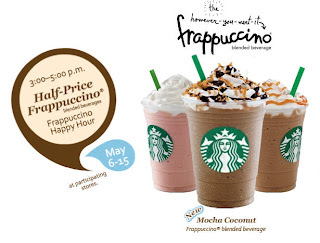 Starbucks is having their Frappuccino Happy Hour between 3-5 pm from May 6-15, 2011. During this promotion, you can get a frappuccino for half price! In Canada you can also text MIXIT to 98075 for a daily Happy Hour reminder. My favorite frappuccino has always been the Mocha frappuccino but I noticed that there’s a new Mocha Coconut flavour that I’m definitely going to try. As always, make sure to give your local Starbucks a call to confirm they are participating! Click here to find a Starbucks near you. Click here for more information about Starbucks’ Frappuccino Happy Hour. This is a limited 1-day only sale that will expire at midnight (Monday, May 9, 2011). Click here to buy now or for more information about the deal. Quantities are limited so don’t miss out! No tipping or gratuities necessary. For almost two decades CA Model and Talent has been in the business of image making and capturing. Today’s deal promises to be a fun and glamorous experience for all.To date, CA has photographed thousands of happy customers and continues to deliver a really special experience for all. CA has photographed people of all ages and racial backgrounds. The studio is comfortable, warm and welcoming as are the staff. The equipment is state of the art. The price is simply unbeatable! Whether you are an aspiring model to be, actors headshots, a business person looking to modernize and enhance your image, a family, a new mom and dad with baby/s or a bride to be, CA offers something for everyone. Gather your outfits, bring a smile and let CA provide a fun and dynamic photoshoot where you are the person of the hour! This is a limited 3-day only sale that will expire at midnight (Wednesday, May 11, 2011). Click here to buy now or for more information about the deal. Quantities are limited so don’t miss out! With today’s WagJag: Take a two-day step on/step off city tour of Toronto for only $18 from Toronto Tours Ltd. Purchase up to six WagJags to bring your cronies along for the trek. Since 1972, Toronto Tours Ltd. has been offering travellers guided jaunts of the Big Smoke with the best in hospitality and transportation. The step-on/step off summer tour, available May through October, offers a flexible and leisurely way to discover Toronto’s hottest attractions over the course of two consecutive days. Investigate local landmarks like the CN Tower, Maple Leaf Square, Air Canada Centre and Royal Ontario Museum, then discover hidden gems in key neighbourhoods like Kensington Market, Church and Wellesley, St. Lawrence Market and the Harbourfront. Your booking comes with a variety of perks and discounts to aid in your city travels (listed below) which can be picked up at INFO T.O. with your boarding pass. The comfortable and air-conditioned tour bus makes nearly 20 stops along a 20 km path through the city’s core, but you’re free to jump off at any time to explore a particular area more thoroughly. The bus departs every half hour from 9 a.m. to 4 p.m., so you’ll have many chances to start and stop your journey. Visit the site to view more details of the trip and to book your tour today. For questions, email [email protected] or call Toronto Tours at 416-868-0400. Some conditions may apply to value-added offers. Subject to change and availability. 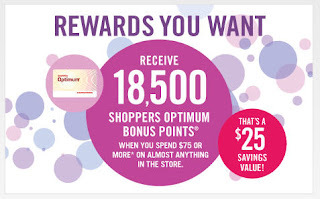 Bring along your Shoppers Optimum Card, from May 9-13, when you visit your nearest Shoppers Drug Mart store, spend $75 or more and get 18,500 Optimum Bonus Points ($25 value). This offer excludes prescription purchases, lottery tickets, transit tickets and passes, event tickets, gift cards and various other items. Some additional restrictions apply. Click here for more information about the deal at Shoppers Drug Mart. Check out your nearest Sears store from now until May 27th, 2011 and receive a great gift with a purchase of $69 or more on Euphoria Calvin Klein. This gift includes a Swing Bag, a Calvin Klein Euphoria Eau de Parfum Rollerball (10 mL), and a Calvin Klein Euphoria Eau de Toilette Rollerball (10 mL). Click here to shop Sears online or for more information about the deal. This is a limited 2-day only sale that will expire at midnight on Monday, May 9, 2011. Click here to buy now or for more information about the deal. Quantities are limited so don’t miss out! Limit 1 per person, may buy 2 additional as gifts. Limit 1 per visit. 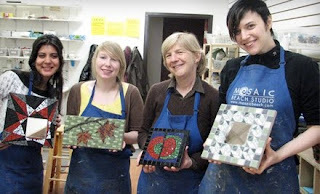 Today’s Groupon: for $39, you get an Intro to Mosaic Art class at Mosaic Beach Studio (a $79.10 value). Classes are available on Tuesdays and Thursdays from 6:30 p.m. to 9 p.m., Fridays at 1 p.m., and Saturdays starting at 10 a.m. and 1 p.m.
At Mosaic Beach Studio, instructor Tanya MacFarlane walks students through creating their own mosaics using bits of vitreous glass, glazed ceramics, porcelain, and found objects. The studio’s two-and-a-half-hour Intro to Mosaic Art class lets would-be glass artisans decorate four coasters, an 8″x8″ trivet, or five holiday ornaments with designs of their own making, such as swirls of colour or detailed portraits of their aristocratic benefactors. The studio supplies all the necessary tools and materials, including the grout students will need to finish their work the next day at home, after their mosaics have dried. Mosaic Beach Studio welcomes glass arrangers of all skill levels and keeps class sizes under a dozen students so everyone gets close attention. Those who complete the class will receive 10 per cent off registration fees for any of the studio’s popular workshops on adding mosaics to tabletops or underpants.